As they prepare to tour its proud graduate exhibition all over Europe, headwear and apparel brand New Era has managed to succeed where many labels have tried but failed. By inviting 90 creative fashion students from the UK and the continent, the brand has re-energised its own image while at the same time giving a new generation of designers a blank canvas to work with. From the student’s point of view, that canvas presented a challenge – there’s only so much you can do with a hat! But if you venture down to the current Brick Lane exhibition – or look it up during its European travels this winter - you’ll see just how much you can actually do with a baseball cap. In conjunction with New Era’s 90th anniversary, the brand sent out an invitation to students from the “most prestigious design schools to unleash their creativity on a New Era 59FIFTY”. The impressive result is now on show, and the overall winner, Craig Green, here explains to Dazed Digital how it all happened. Dazed Digital: What was the reaction when you found out you won? Craig Green: Me and my mum were screaming in the kitchen. It took us – me, my mum and some friends – two days to make the hat so it was a bit of a family affair. DD: Tell us about your design background? Craig Green: I finished my BA before the summer and I started my Central Saint Martins MA last week. I’m studying fashion menswear print, but I want to do menswear fashion, really. DD: How did you come across the New Era competition? Craig Green: Someone told me about it, I sent them an email and then the New Era hat arrived and I started working on it. DD: What inspired the hat? 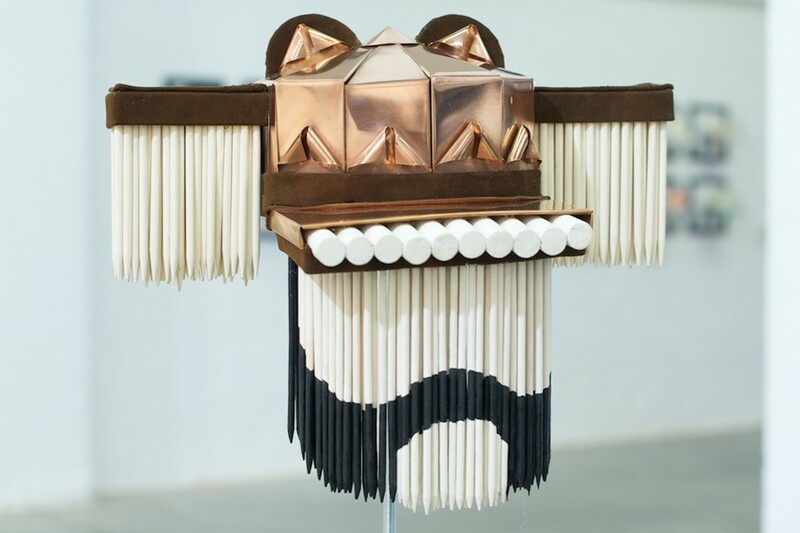 Craig Green: The mask of masculinity was key in my design, with references to the role of the male in western society. Taking influence from both American and English culture I made reference to class, money, patriotism, D.I.Y, nature, Native Americans and hunting. Looking at the outdoorsman; hunter- gatherer and the boyhood fantasy of adventure, I have attempted to create a cap that is as much about culture as it is about escapism. DD: What sort of material did you use and where did they come from? Craig Green: Mostly materials from my room actually, I couldn’t afford to buy new stuff. That's where I found the wooden sticks, because my final collection was based around sticks. I bought the sheet bronze, but I already had the kebab skewers that we then painted in magnolia. DD: What is your own personal relationship to the brand New Era? Craig Green: I have a few hats and kinda liked the brand but I didn’t have a major connection to them. But I was still scared that what I wanted to do was too far away from what they normally do. I was even calling them asking how different from their normal hats, and what the brand really is, I could go. They were fine with me going a bit crazy, which is really cool! DD: So how would you define the brand? Craig Green: It’s a wearable street wear label, but seeing how they’re doing this and inviting all these graduates to participate, it makes you think that they’re quite forward looking. Craig Green: Yeah, you can’t really wear it. It’s heavy and small and the all the sticks make it difficult to see, even if they swing a lot. DD: What are you doing with your prize money? Craig Green: I’m gonna get some really boring but necessary stuff, like glasses and proper shoes, but the rest I’m going to save for my MA graduation collection or to rent a studio once I’ve done my degree. DD: Do you have any other favourite hats in the show?